Proactive EssentialsPLUS AM/PM packets incorporate the latest scientific findings and include high potency vitamins and minerals along with high levels of antioxidant protection from harmful free radicals. 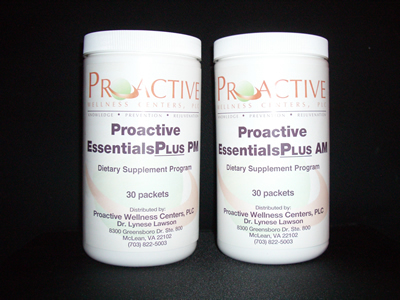 Specifically, Proactive EssentialsPLUS all of the ingredients of Essentials including the highly versatile nutrient and antioxidant Alpha-Lipoic Acid along with Marine Fish Oil. Alpha-Lipoic Acid provides antioxidant protection and helps regenerate other antioxidants including vitamins C and E and the key protein glutathione. Marine Fish Oil includes omega-3 EPA and DHA fatty acids and provide support to the immune functions, regulation of inflammation, lipoprotein metabolish, brain function and mood regulation. In addition, EssentialsPLUS includes a therapeutically significant dosage (120 mg) of CoEnzyme Q10. CoEnzyme Q10 helps protect the heart muscle, periodontal tissues, immune system, liver kidney, brain and other vital organs from free radical damage. The packets include the following tablets. Please see the label for the complete list of ingredients.